Enough black clothing for me, it's back to brights and patterns! When my man saw my outfit today he said I looked like an "urban zebra", sounds cool to me! I don't typically shop online but I made an exception last year when I saw these zigzag capri pants on sale for $10 at Old Navy. Throw in a free shipping promo and I'm sold! I spent some time before work this morning weeding my lawn (in a much more practical & therefore less fashionable outfit of sweats, a tank & sneakers). As a first time homeowner, I wasn't aware how much yard work would be required and how pesky dandelions are! I am told the hedges behind me are called bridal spirea and they are gorgeous at the moment as they are in full bloom. But again, another high maintenance task as they require trimming (which I can't seem to do straight so they end up looking like the zigzags in my pants!) I'm not a natural when it comes to gardening but I'm learning as I go and may even do some landscaping design this weekend! I have those same pants. Got them on super sale, but haven't worn them much as I find it hard to figure out what to pair with them. I don't have a green thumb at all. I do plan on planting some flower when I get my place in July. Loving your carpis. Love those pants! You better put a lock on your closet or they may disappear soon... The rest of the outfit is great, too. I like to garden; even without any talent, my plants seem to grow on their own. I think I do pretty well in the garden, when I put some effort into it :) Love your outfit. The pants are adorable and I think the colors look amazing on you! My parents are incredible gardeners (IMHO) but I am a newbie like you. We just did our annual run to get our patio plants for the summer and I was super happy when my mom suggested buying pre-prepared hanging plants and transferring the whole thing to a pot rather than getting them all individually. I lol'd at your comments about your hedges matching the zigzags in your pants. Here's to a summer of learning to create a garden oasis! urban zebra-- I LOVE IT! 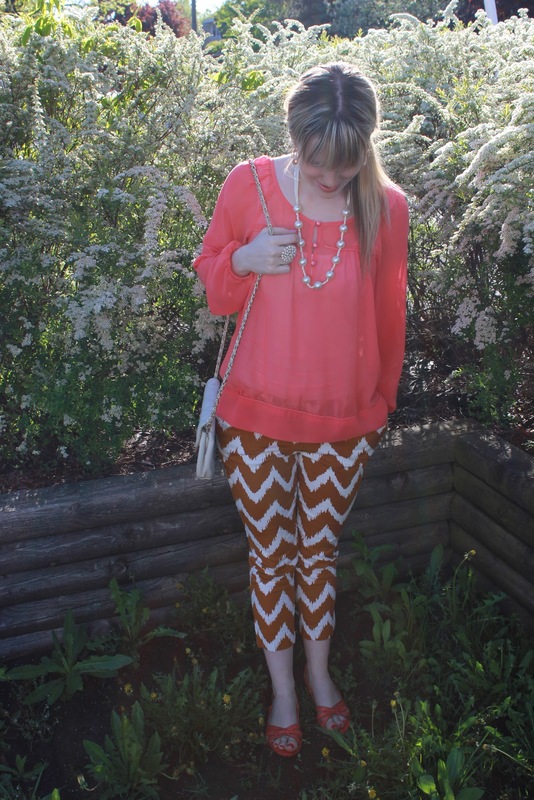 Those pants are awesome-- you really know how to rock a bold print, Emily! I love these pants on you! They are perfect with this outfit. You look great. hooray to looking good urban zebra! :) i sure can appreciate well done gardens and landscaping. my thumb is black. i kill everything.